Compelling poetry distorts as much as it clarifies, and it expands the boundaries of language. A great poem, to me, explores a central idea or feeling by rendering a moment “still” with words, syntax, and structure. Richard Brautigan’s “I Was Trying To Describe You To Someone.” This is a bit of cheat, since most consider this a short story, but it reads like a prose poem to me, existing somewhere between poetry and flash fiction. The piece is one big nostalgic wormhole. The language is playful (I love the line “I think I was seven or eight or six”), and the tone is conversational, yet precise. 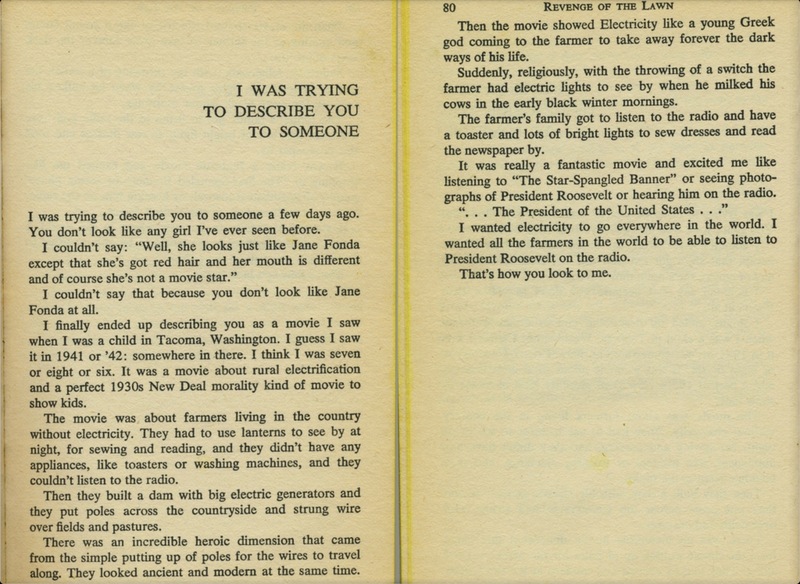 Brautigan likens electricity with romance to explore the difficulty of describing love to another person. The lights turn on and off, the same way love can turn on and off. Runner-Up Favorite Poem: Charles Bukowski’s “Young In New Orleans” because it’s hilarious and dark and true. Too true.